Cargo Mission – Summit Helicopters Pvt. Ltd.
Captain Aashish Sherchan recently accomplished the cargo mission to support the Expedition, which is on the verge to begin after a long disrupt caused by last year’s disastrous avalanche in the Khumbu Icefall. B3 Helicopter of Fishtail Air took the flights with the tents and other gears required for the Expedition from Phaplu and dropped at the airstrips of Syangboche. 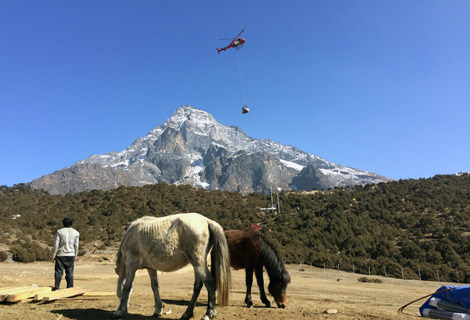 A sling operation was made to drop the cargo at Syangboche airstrips. Capt. Ranjan Limbu, a new pilot in the aviation industry supported Capt. Sherchan for the 10 days mission.